Intended use: The Canine VacciCheck kit is used for the detection of antibodies to Infectious Canine Hepatitis (ICH), Canine Parvovirus (CPV) and Canine Distemper Virus (CDV) in dog whole blood or serum. 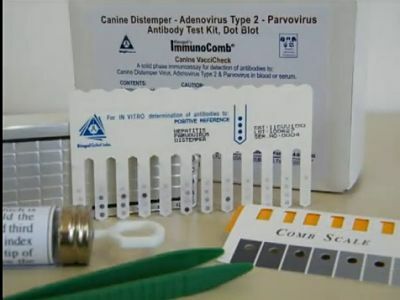 Performance: During studies conducted under GCP for the the registration of the Canine VacciCheck kit with the USDA – Center for Veterinary Biologics, the sensitivity and specificity of the kit were respectively 100% and 83% for CDV; 96% and 82% for CAV-2; 88% and 100% for CPV. Why is antibody detection important? In a study conducted on 500 vaccinated dogs, approximately 10% failed to develop antibody to CPV-2 or had exceptionally low titers. Also in that study approximately 5% of dogs were noted to have low or no antibody to CDV (L.J. Larson & R.D. Schultz 2007).